What to Do About Windows XP - Ask Leo! Hi Everyone! I’m Leo Notenboom from askleo.com coming to you today from the palatial travel trailer where I often do many of the AnswerCast recordings. It actually has a nice, not too echo-y feel to it based on the internals. It’s basically a good, portable recording studio. Although today you may hear a little bit of wind in the background since we’re actually in the middle of a little bit of a windstorm. So, over the past couple of months, I’d say that Windows XP related questions, most boiling down to “What do I do about Windows XP support ending this coming April?”, have been very common. I want to go over what some of my suggestions are; what you need to do depending on your situation to deal with the end of life of Windows XP. Now, the very first thing I want you to do regardless of your situation is to back up your Windows XP machine. I say that because, well, you should be backing up in general; but some of things I’m going to suggest you move to are going to be trials. They’re going to be changes you might want to give a try, but not necessarily commit to. So by having a complete image backup of your Windows XP system, you’ll be able to restore your machine to the state it was in at the time of that backup, if for whatever reason, one of the things we try doesn’t work out for you. So, the first thing that I’m actually going to suggest that most people do is (if your machine is actually capable of supporting Windows 8.1) to upgrade to Windows 8.1. Now I know that’s not necessarily a popular answer because everybody’s all freaked out about Windows 8.1 with the metro interface and the tiles, and all that kind of stuff. You know what? That’s a red herring. It’s a really bad first impression that Microsoft gives us with Windows 8 but it’s completely irrelevant. All you really need to do with Windows 8 and 8.1 is install some freeware called Classic Shell. There are some alternatives as well, but what Classic Shell will allow you to do is boot directly to a desktop that looks exactly like Windows 7 and in fact, install a Start menu that can be configured to look like the Windows XP Start menu. If you’ve got a couple gigs of RAM in your machine, and you’ve got a relatively good hard drive with enough space on it; it’s really what I would suggest most people do. Now, the other gotcha with Windows 8.1 is whether or not your external devices are going to work with it. Things like printers and scanners seem to be the most problematic. And yes, if Windows 8.1 doesn’t support your printer, your scanner, or some other piece of hardware that you have, then I don’t have an answer for you. The only way to find that out of course is to see if there are Windows 8x drivers for your hardware or as I kind of alluded to before, giving Windows 8 a try and seeing if that hardware can be made to work. If it does, fantastic – you’re done; you’ve got a new working machine with Windows 8.1. If it doesn’t, then yes, you can revert to Windows XP. Now, the other approach if you find that Windows 8 doesn’t support your hardware, is to consider something like Linux. There are several Linux distributions out there. The one that I happen to use most often these days is Linux Mint. It’s one of those things that can be configured to be relatively Windows-like, but I want to be clear that there will be change when you switch to any of the distributions of Linux. It’s not going to be Windows XP; there are going to be differences. Probably just about as many differences as there would be in moving from XP to Windows 7. Actually, I’d say that moving from XP to Windows 7 or Windows 8 probably has fewer differences than moving to a Linux based system. (But of course, Linux is free.) Between Windows and Linux the concepts are absolutely all the same. None of your Windows programs will run, but depending on how you use your computer, you may be able to find suitable alternatives. For example, if all you do is use the web and email, you’re done. Linux will do that. There are web browsers and even in fact, Thunderbird, the email program that’s available on your PC; it’s available on Linux too. Firefox – same story. In fact, it’s probably the default web browser on most Linux installations. Linux installations typically require less from your hardware, and even if you have a really marginal machine, there are Linux distributions that are specifically tailored to make less use of your hardware specifically for smaller machines. So that’s an approach that you can look at. Again, this is one of those scenarios where you might want to give it a try to see whether or not it will work for you, and if it doesn’t then revert to your Windows XP using your backup. Finally, you know, I hate to say it because I know this isn’t for everybody, but you can get a new machine. I know, new machines depending on what it is you need, can be really expensive or not that expensive. Some new Windows machines aren’t all that expensive. The low end ones aren’t, and the low end ones are probably more capable then the machine you have today if you’ve got an old machine running Windows XP. They probably already come with Windows 8.1 so you’ve got a working system but again, this depends on, of course, your budget and I understand that many people have no budget. And it depends on how you use your machine; what it is you’re actually going to require that machine to do in the future, but it is one of those options that’s out there. Staying with Windows XP is an option and I know that it’s an option that many of you, to be honest, are just faced with either by choice or of necessity due to budgetary or other constraints. I get that, I actually respect that. But it is one of those things where it’s going to get riskier over time. I mean there are people that are still running Windows 98 or Windows ME. The problem is of course, they’re not getting any updates; and as they move forward less, and less software is available to actually run on those machines. But they may not care for whatever they’re using that machine for. The same is going to be true for Windows XP, with one important addition, and that addition is going to be, and you’ve heard it before – malware. Since there are so many machines out there running Windows XP, malware authors are going to continue to target Windows XP with the assumption, with the hope, that whatever they find that might still be vulnerable in Windows XP isn’t going to get fixed. So what that means to you as a continuing Windows XP user, is that you need to be secure; you need to keep your anti-malware tools current and up to date, and yes if someday your anti-malware tool stops supporting Windows XP, you need to get a new tool; you need to get one that support Windows XP and will continue to support Windows XP for as long as you use it. Make sure that tool is up to date; make sure that it is getting regular anti-malware database updates. And I mean that daily if not more frequently. It’s really important. 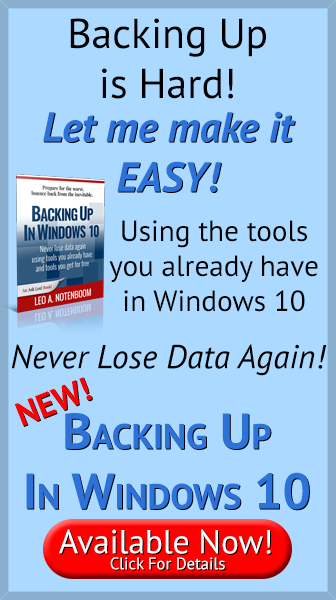 Backing up is going to be even more critical than before. We’ve always referred to backups in terms of saving you from hardware issues but in reality, backups are a wonderful way to save yourself from malware. For example, if you’re backing up nightly, and then today, your machine becomes infected with some kind of malware, all you need to do is restore the backup that you took last night. Then you’re malware-free and you can avoid doing whatever it was that caused that malware to be on your machine in the first place. So, that’s one thing; start backing up if you’re not already. Make sure you’re backing up religiously, and finally, use common sense. They are going to be people that are going to try and take advantage of this situation. Be it malware authors, be it less-than-legitimate software vendors, be it just anybody, they’re going to try and leverage the fact that you’re still using Windows XP to take advantage of it; to infect it with malware; to sell you things you don’t need – whatever. Become aware of this. Be skeptical; always be skeptical when approaching the internet. Don’t run those downloads; don’t run those attachments that are coming to you in email. If you have some way of doing that on a different machine that isn’t a Windows XP, that’s a step in the right direction. In general, staying with Windows XP is an option, but it will only become riskier and riskier over time. So, to sum up: if you can, upgrade to Windows 8. If you can’t, consider something like Linux. If you can’t do that, stick with Windows XP. Is it time to consider switching? And finally, if this whole scenario has you just really pissed off at Microsoft for dropping support of Windows XP, I’m not going to debate you on that, I’m not going to agree or disagree with you in this video. But if you’re going to make that jump to something other than a Microsoft operating system, now is the time. And that means that yes, Linux becomes a very viable solution for many people, as does Apple. If you’re going to get a new machine, you know Apple’s are going to be a little bit more expensive, but they’re not that much more expensive these days, and they are solid machines. In fact, I’m recording this video using a MacBook Pro. They’re good machines, Apple’s operating system is solid, and many people find it easier to use. Once again, what it all boils down to is how you use your machine. What software do you need to have running on your machine to make it a useful tool for you? That may be Apple software; that may be software that runs on a Mac. It may be Linux software, or you may be stuck with Windows for what you need. But hopefully now, you at least have some ideas of what the options are, what the choices are and what kinds of things you might consider doing in the future. From a trailer back behind the barn, I’m Leo Notenboom for Ask Leo! Can my image backup of Windows XP be used on my Windows 8 computer? - Backing up, particularly with backup image software, is for recovering from a disaster. It can also be handy when moving to a new machine, but probably not in the way you are thinking. « Previous post: How do I stay protected using an administrator account? I am going to have to migrate my 80-something year old parents from XP to 7 or 8. They use and “get” Outlook Express with a Gmail address. They rely heavily on this program for communicating with family. While I’d like to get them to use a Gmail web interface, they probably aren’t going to get it. I’ve tried. My question is, what email program is out there that is closest to OE, once I get them on new hardware with 7 or 8? What would you recommend? Is there a web GUI that simulates OE? Nothing is exactly like OE, but Windows Live Mail probably comes the closest. The closest I’m aware of is Windows Live Mail. A free download from MS.
As others have said, nothing is exactly like OE; but Mozilla Thunderbird comes pretty close. It’s easy to copy settings from OE to T’bird, and moving mail from OE to T’bird is just as easy. My only complaint with T’bird is the format of “inserted” signatures. I have a dedicated XP machine only because I have two old but very useful items of software where the graphics refuse to run under any manifestation of XP within Win7. The latest versions of these are very expensive and changed so radically that I’d have to start again from square one rebuilding ten years of work. If I can isolate this pc from the internet but keep it connected to my home lan I’m assuming I’ll be safe from malware. Don’t presume your XP machine will be malware safe. I’ll be doing the same thing with my XP machine, but I recognize it will only be as safe as the Host machine connected to the Internet. As Leo has said elsewhere, the only truly safe computer is one that is never turned on. It will be “safe,” but not good for anything. It’s a dangerous assumption to make in an absolute sense. Malware can and has been known to “jump machines” – much like it can travel on USB drives. I’m not saying that yours is a bad option – it may be the only option – I’m simply pointing out that “assuming I’ll be safe from malware” isn’t really a good assumption. I couldn’t upgrade my perfectly-good-but-old laptop 1GB laptop to Windows 8. I installed LinuxMint instead and it works great. Does everything I need it to do. Has an app store for easy software downloads. I experienced no driver issues at all. Linux has come a long, long way since you bought that XP computer. If you want to extend its life and enjoy a safe, secure, modern OS, I highly recommend checking out the free LinuxMint OS. I agree 1000%. I’ve been using Linux Mint for a year now and love it. In fact, I liked it so much I replaced XP completely on my old PC and now just use Linux Mint. Also, if you want a Linux distro that’s close to Windows 7 try Zorin. It’s very light on resources and very menu driven. Love it and dual boot between that and Linux Mint. Super combo for zero cost on a 9 year old PC !!!! Linux Mint is a fantastic XP replacement OS, I have 3 installs of Mint 16 & one install of Mint 13 on an old T42 Thinkpad that doesn’t have PAE. That OS is still supported until 2017. The main gripe about Windows 8 is the lack of a Start Menu, which Mint has. Ubuntu has followed the Windows trend to some degree, their old Start Menu is gone & like Windows 8, one has to search for infrequently used software. In certain situations using VirtualBox is a viable solution too. Certainly it requires a reasonably good machine, but the benefit (say) of running XP as guest on a Linux, Mac or even Windows 7/8 machine is terrific. I have several programs that run on XP so I run them on a Linux host in VirtualBox. There is a lot to like about this approach. As an aside a really light Windows look alike Linux is LinuxLite – I changed from Mint 16 to LinuxLite on an old laptop and it performs well and has a much more Windows XP like look and feel. Good point. Virtualbox is great software but you need a pretty decent PC to run it otherwise the “guest” operating system (s) will lag. I have one computer with Windows XP. I am keeping it because I have a laser printer that will only run on XP. I do not plan to go on the internet with that computer. Leo, Love your “Recording Studio.” Thanks for this video, have both XP and Win 7, machines. Thank you for the great advice regarding this change. will using an XP machine for syncing with an ipad via iTunes create a security problem? There’s no absolute yes or no – all I can say is that I can envision scenarios – albeit unlikely – that it’s possible. All reasonable suggestions that have been around for quite a while, except Leo buried the lead, user habits and behavior are always the most critical regardless of OS and support and malware protection, by far. Unless one has a desire or need for the two-sided Jekyll and Hyde that Windows 8 is, stay away. One can make it work as a traditional desktop but Leo isn’t mentioning it’s actually more work than just a start menu replacement, all defaults will tend to dump into start apps and there’s two versions of some programs like I.E. so defaults about where and when these programs will open dependably have to be sorted as well; not bad on a one by one basis but multiplied by tens or hundreds and its pain in the dairy air and colossal waste of time now because Microsoft realizes their huge mistake (from a sales standpoint its a disaster like Vista) and there will be future versions of Windows that don’t need so much fixing up for business and productivity users. What I’ve been seeing lately in great numbers is the purchase of Windows 7 (the word must be out) either on refurbs or install discs from third party vendors to replace XP. On some of the other forums I follow it seems like questions about upgrading to Win 7 now are at least 10 to 1 more than those concerning Windows 8 upgrades. Excellent advice Leo…thanks for the video. I’m going to share it with a friend who is running what his computer came with (XP) and doesn’t even want to think about changing…yet! I use about everything, including Linux, and concur with your Linux Mint recommendation as well. Easy to install, maintain and provides an at least somewhat familiar interface for those who are new to Linux. Thanks! I tried Windows 7 and hated it and returned it 2 days later. My printer wouldn’t even work with it. I love XP and will keep it. I just had a new hard drive installed so I’m set to go. It seems to me that the reason for Windows 7 & 8 are mostly for people who have other web devices. Well I don’t. I have a desktop PC only as I cannot type or maneuver on laptops and hate them with a passion. I have a flip cell phone and do not text. I’m too dumb for a smart phone and see no need for them at all. I don’t even know what notebooks are or other devices many are using now. I watch TV only on my two large screens. Can’t imagine wanting to watch on a computer or a phone or a watch!! I real real books, not e-books. I guess I’m a Luddite and proud of it. I don’t click on .exe or other attachments without first scanning them for viruses. I know folks who are still using 98 and 95 yet with no problem. Many people think that these Windows XPocalypse predictions are over blown, because they know people who are still using programs as old as Windows 98 without any problems. What they don’t take into account is that very few people are using these older OSes which makes them a very small target. Windows XP is used on about 15% of all Windows computers. This makes them a side of a barn door sized target, and hackers are champing at the bit waiting to exploit the holes in XP after support runs out. Will being extremely careful mitigate the dangers? Maybe, but it’s a risk I’m not willing to undertake. XP is like an old car with faulty brakes, you might have a technique for stopping the car, but the condition will be continually worsening as more and more vulnerabilities are discovered. I am exactly like you, Karen, altho I have never tried WIN 7. Thanks for the heads up on that. Not only can I not afford to buy a new PC, I don’t want WIN8 or 8.1, I like XP. I don’t back up my comp because I don’t know how. I am 71 yrs old & my learning abilities are diminishing rapidly. I feel this is a dirty trick from Microsoft. We trusted them. This is the only way I can keep in touch with my grandchildren & get to see pics of my great grandchildren. If something happens to my computer I will be devastated. I don’t know what notepads, tablets, etc. are either. I don’t have a smart phone. In fact, I’ve never even seen one. Couldn’t afford one anyway….on $820/mo. So what will we do?!!? That is the question. I’m certain we aren’t the only ones in this situation. Hang in there, Karen!! Good luck!! I just got a response to a message I had posted on a Dell forum. The response was centred more on me saying I had decided I would continue to use Windows XP after 8th April rather than my question. I am not sure to believe what was said and find it hard to believe on several levels. Would banks such as HSBC really deny access to customers using XP and how would they know I was using XP? I couldn’t say for sure, but it seems that since 95% of ATM machines will still be using Windows XP after April 8, it is probably an unfounded rumor that banks will block XP users. Also, it seems to me that the banks would have sent out a warning to this effect several months ago to prepare their customers. I fully agree with the options Leo sums up. From backing up your data and system to switching to Linux. The latter means a more substantial switch than Leo suggests (IMHO, that is). For someone who has had experience with (e.g.) DOS or Unix commands it’s a lot easier than for someone who is used to GIU’s only. Command line instructions do need some learning but everything works lots and lots faster! So I’m seriously considering testing some Unix builds on a ‘surplus’ XP machine. My understanding is that security updates to the OS stop in April of this year. Updates to the security software, on the other hand, like Microsoft Security Essentials, will continue into 2015. – I’ve never had any problems with XP. – The only message I get from just one bank is that my browser is outdated and that I’d better switch to “X”. – I’ve had no problems with my current browser (IE8 – and yes, I consider changing). But I find it over the top that they actually advize using one specific browser over another while they are legally responsible for all traffic between themselves and their clients, whatever browser or operating system the client uses. This is a practice that asks for closer scrutiny by European legal institutions. But that is not a technical question… or is it? – ATM: If and when you choose to withdraw cash or do any kind of operation via a public ATM-service your operating system should not interact with the bank’s system without your knowing about it. When it happens that there is “interference”, you should asap contact your bank. As Leo says: “it is probably an unfounded rumor”. I myself would ommit “probably” in that quote. They could – it’s typically part of the information the browser includes when it contacts a site. Whether they would is another story. It’ll be interesting to see how that plays out. It is now April 2019. Have not had any problems with XP due to malware. Get an AV that uses an “A” list and keep it up to date. Make sure you have maximum ram, because an “A” list AV is going to use more ram. It’s could be possible. Banks & other sites where transactions are made create their own rules as to security. For example, there’s many places that won’t allow for IE6 to be used, so that’s one component of XP already kicked to the curb. Most financial institutions requires browsers that connects to their sites to have a certain level of inbuilt protection (encryption) to protect all customers. The latest browser from Firefox/Google Chrome/Opera will meet the need. I don’t know how they can tell what OS is being used, but do know they can the browser. However many XP users uses another browser other than IE, for starters there’s more security, secondly IE8 is a resource hog on an older computer with 1-2GB RAM. It could also be that in the future, ISP’s themselves will require a supported OS, as say on cable based ISP’s, everyone in a given area is on one main line. That’s why during peak times, one may see significant loss of advertised speed. To the point, malware from infected computers can also travel through that same line & those with less than the best protection (such as users with MSE/Windows Defender) may get infected. If there are numerous infections in a given neighborhood, the ISP will investigate the source of the infection, where it’s coming from & can actually locate the physical computer causing the damage. The terms of most ISP’s includes not spreading viruses or malware, Which can lead to loss of service (& potential cost of cleanup) until the computer is removed from the network. A repeated event will likely cause termination if service. Chances are that the customer will receive 3 or more warnings before suspension of service if the events are minor. So not only the banks, but also down the road, ISP’s can blacklist XP on their networks. That could be a blanket policy or case by case basis. Being that Windows 2000 is still able to connect, I don’t see ISP’s dropping XP in masse, but on individuals who are infecting the region. That’s a reasonable policy. Whats wrong with just upgrading to Win 7 ? My transfer from XP to win7 was smooth. Love it. Using third party software for programs is barely tolerable, but using it for an operating systems frightens me a bit. My guess is that because win7 is such a great product (like xp was also) it will remain safe for a long time. I see on some ebay sites that win8 is cheaper than win7… why is this? Could it be they cant sell it? Windows 7 is no longer available retail, so people can get more money for it. It probably does have something to do with people’s unjustified fear or dislike of Windows 8. Mike there are people such as myself whose finances are so tight that they cannot afford an upgrade. Then consider those people who can maybe just afford an upgrade then find they have to somehow find extra money when one or more of their peripherals don’t work or God forbid cannot get their internet connection to work. When or if my financial circumstances improve to an extent that I would be able to afford a Mac then I would jump at the chance and kiss MS goodbye. I tried Apple once, because of all the hype over how superior they were. My hard drive crashed after six months (something I’ve never experienced with my PCs) & their repair services were substandard. Once repaired, I continued complaining until Apple bought me “out” & refunded my purchase price! I used the money to buy a decent PC PLUS a Google TV & never looked back! We all know MS isn’t perfect, but a lot fewer know that Apple isn’t either! I loved your video.Your presentation and style covered all the bases. I’m a paid subscriber and you dont charge enough for all the valuable information you provide. Keep up the good work. John is just paying peanuts. I’ve been on WinXP for many years, and am completly happy with it. I looked into going to Win7 when it came out, but as Microsoft had made no provision to migrate my system I held off for win8. I have two laptops, one on win7 and one that came with win8 installed. The win8 laptop I use with great frustration and some difficulty – the experience has confirmed my determination to delay as long as possible the switch to win8. My computers are by choice not ‘touchscreen’ – the touchscreen gui format is completely unsuitable for traditional mouse/keyboard operation. Like millions of everyday computer users, I don’t need or want touchscreen technology on my desktop or laptop computers. I am disgusted that microsoft is being so arrogant as to inflict this awful operating system on millions of commercial industrial users of computers- it involves significant expense and inefficiency while staff are retrained to use computer systems that, at the end of all the frustration and expense, are used to produce the same work output with negative or at best insignificant work output improvement. Touchscreen may be well suited to ‘gamers’ and personal entertainment users, but is not suited to most commercial/industrial utilitarian type users. I will wait until microsoft provide a more practical user interface to win8 that allows traditional XP type mouse/keyboard operation and control, interfaces to XP compatible devices, does not involve downtime while retraining basic computer operators and provides an easy migration facility from XP. If such a package does not become available in the next 12 months or so I will look at using the disruption time to move off the microsoft operating system altogether. You can get that traditional XP type mouse keyboard operation today by installing Classic Shell. My brother’s laptop came pre-installed with Windows 8 and so after trying Classic Shell it was recommended he pay £3 for a piece of software called start8 which emulates Windows 7 with the Start menu and Windows Explorer. Needless to say he is more than happy with it. If you get Classic Shell from the originators web site – classicshell.net – and not some download site there should be no malware. I’ve downloaded and installed it repeatedly without any problems what so ever. This is the first time I’ve seen you on video doing “Ask Leo” and I think it is really neat. You give out so much more information, in a period of time, than by writing and me reading it. Something else you didn’t mention that makes image backup very important is a system or HD crash. Not long after support ends, the updates will no longer be available, either. Unless MS decides to send out a final SP, like they did with Win 98, an XP rebuild would stop with SP2. The only way one can get the all many patches/updates since then would be with an image backup. All of the updates and service packs for XP will still be available for some time after XP’s end of life. It’s probably safe to assume that Microsoft will give a warning well in advance of pulling these updates from their website. SP3 is available on Microsoft’s website. You could download that now. That helps, but there have still been a couple hundred updates since SP3, I don’t know how you would easily download all of them and have them ready to install. I have my doubts that MS is going to release SP4 on April 1. I think Leo’s suggestion is the easiest. Take an image backup. Do it on April 1. That way you’ve got all the updates installed, so if you have to restore, you can restore back to the way it was on April 1. It may be more problematic if you completely change your hardware, but if all you do is replace a hard drive, restoring from the image backup is likely to work. Thanks for the correction. I did mean SP3 instead of SP2. My hope is that MS will issue an SP4. As to when will depend on the demand. The final SP for Win 98 came out with XP SP1. Since MS is taking the approach of issuing new OSs instead of SPs, it’s anyone’s guess on an SP4 for XP. Last year the word was “No,” but like everything else, that is subject to change. Either way, my point was that Leo’s recommendation is the best option. Since I haven’t tried it, I wonder if an image of one drive would properly install on a different sized drive. Outside of malware, drive failure is the greatest threat – which is why it is a very good idea to keep data on a separate drive from the OS. Typically drive size changes can be handled when you restore. Depends on the backup software being used – some just let you handle it, expanding the drive appropriately. Others would perhaps require that you run a partition tool after the restore to use the extra space. Very common scenario as drive sizes keep increasing. Thank you, Leo, for the extra information. A related question, if not completely on-topic. In detail, how is the done, or is it just a ‘SYSTEM” backup and restore? Check out my articles on Macrium Reflect for one step by step example on how to make and restore image backups. So Connie in your world no one has financial problems such that they are unable to upgrade or purchase a new computer? The post Connie replied to made no mention of money problems. Last time I checked even poor people can have good attitudes. Ok, I can afford a new computer when this one breaks – but why should I have to buy a new one just because the computer company wants everyone to update update upgrade upgrade every five minutes – sure it’s good for the company. What bothers me most is the (wasted) TIME, the time it takes to find my way around each new maze of default settings which always need to be customised just to make life comfortable. The time spent trying to learn how to block cookies and spam and autoplay ads and all the popups! The time spent backing up all the things I want just to transfer to a new computer. Like I said, just leave me alone! (Please.) – Leo, you say life changes – fact, just get used to it. Sure, Leo, but only some of the changes are improvements. Most of them are gadgets, tricks that haven’t yet been thoroughly tried out, new games to get people to buy stuff. We really don’t need it! I agree, that pollution from old computers is a huge concern. The discarded computers are quite toxic. Also, for people with limited incomes a computer is a huge investment. Having to replace such an expensive piece of equipment can be pretty tough! Just complaining doesn’t do anything about it though, so I still agree with Leo about the most important attitude. In the end we have to find a way to move forward, even if it is moving forward to Linux on old machines. Thanks for this article, Leo. I just want to add that there are a lot of senior citizens out there who own WinXP computers and who are not too pc savvy and do not know about MS’s April 8 date. I am a senior citizen who is not nearly a geek but do light volunteer pc work for seniors in our small town. S I am advising most of the seniors (that I help and know and that I think can afford it) to buy a Windows 7 (on-line). I have 3-4 pc’s that I have repaired and run Vista and Windows 7 that I plan to donate to a couple of seniors whom I know can not afford a new pc. I think it would be cool if you would address the “seniors with WinXP computers” in one of your newsletters as there may be a few of your subscribers who may want to advise some senior neighbors, friends, or family about the WinXP issue. Thanks for all of your advice as I have learned a lot from you and a few other real geek newsletters. Thank you Larry Ray!! I am one of those seniors you are talking about. I can not afford to have another OS installed not to mention being unable to buy a new machine. I wouldn’t know where to begin to install a new OS or even back up my computer. I am stuck with XP. I am able to stay in contact with my grandchildren & see pics of my great grandchildren. Without my computer this would end. I would be devastated. I sure wish we had someone in my area who helped seniors with this change. Thank you for all you do!! Many years ago one of the largest manufacturere of PC type machines was Amstrad. When they brought out one particular version of their machines they made it exactly according to IBM specifications – but they were probably the only company to do so, even IBM didn’t adhere too tightly to their own specifications. Then DOS 4 came out. It ran on any computer except Amstrad’s and Amstrad did not last very long after that. I don’t know if that was the origin of the old adage “Never buy a Microsoft operating system with an even version number.” Amstrad was not the only company to have problems with DOS 4. However Dos 3 (especially Dos 3.3) and DOS 5 were excellent. It is as if the even version systems are radical experimental ‘”lets introduce all the new technology around” types of system, whereas the odd versions are more conservative “let’s get this right!”. Linux used to use this approach more formally. Kernels such as 2.5 were experimental with lots of new features but for production use 2.5 was recommended. Most people seem to prefer the conservative systems because they use computers as a tool rather than a toy. People who like new technology are the ones who should use the experimental ones. As for Mint. I have tried it and liked it. I do not use it though. The problem is that tere is a new version released every six months and ther is no smooth upgrade path from one version to the next. It is suggested that the OS be reinstalled rather than upgraded. Now Mint is actually a shiny version of Ubuntu, and Ubuntu does have a smooth upgrade path. For instance, about 4 years ago I installed a server with Ubuntu. This server was just used for a few months then replaced by something more powerful. Two weeks ago however I decided that I had a use for the old server so rather than reinstalling I just ran a dist upgrade. This was completely painless. Now, Ubuntu is actually just a shiny version of Debian. If you are very conservative Debian is probably the distribution to use. Debian stable is less up-to-date than the other distributions but it is guaranteed to be almost perfect, all the software has been tested again and again and bugs are rare. When I am asked about Windows V. Linux I usually suggest the following: If you are the sort of person who browses the Internet, checks email and uses word processors and spreadsheets Windows and Linux are pretty much equivalent. If you are a more advanced user then Windows is probably the better choice since there is a huge range of software available and lots of support. However if you want to do really hard work such as maintaining a large computer network then Linux is the better choice. The lack of an easy upgrade path in Mint is definitely an issue. One of the Linux systems I now recommend is SolydK (or SolydX) which mixes the ease of use of Mint and Ubuntu without the Ubuntu overhead. It’s based on Debian Testing and incorporates many of the Mint ease of use features, having been originally a variant of “Linux Mint Debian Edition” (LMDE). It’s a semi-rolling release and updates are quite simple. Outlook Express is the only e-mail client I have ever used , and I have found it simple to use, with all the features that I need. Consequently, I have been searching for a replacement desktop e-mail client for use with Win 8 Pro, that is as close as possible to OE 6, which I use on my Win XP SP3 laptop. “OE Classic” ( http://www.oeclassic.com/ ) appears to be the closest, & can be used on Win XP & Win 8 Has anyone here come across it ? The author contacted me a while back to evaluate it. At the time I found it lacking many features of the original Outlook Express. I’d love to hear your feedback if you find it helpful. In general Windows Live Mail (a free download from MS) seems to be the closest, though there are differences. I tend to recommend Thunderbird. Leo, thank you for the info. Who is the OE Classic author ? What version did you evaluate. Any comments on these alternatives ? Would really like a web mail account with a much simpler & less confusing “User Interface” than Gmail, with just folders & subfolders for organising e-mails, & excluding all that other confusing stuff . Do you have any suggestions ? Yahoo ? Hotmail ? etc. Quickly read through your OE article, linked to by Mark Jacobs. Very informative. Will have to read it more thoroughly though. Mark, thank you for your info & the link to Leo’s very informative article. It’s a shame though, that OE Classic is unsupported & unpatched, although 8 updates ( up to V1.9 now) have been released since V1.0 (2 April 2011) . What version did you try & when ? I like the looks of it from the screenshots – just like good old OE6. Regarding Leo’s comments concerning the loss of mail when compacting OE folders, I take the precautions of (1) ensuring dbx folders do not get too large (generally less than 100 MB /folder), (2) closing ALL other applications when compacting (3) turning off real time scanning by the antivirus software in order to prevent any possible intereference with the compacting process (4) disconnecting from the internet, as a precaution without AV RTS protection, but also to prevent any possible interference by the automatic updating of other applications . I have 210 folders containing thousands of e-mails, so it is difficult for me say with 100% certainty that I do not lose e-mail when compacting, but I am fairly confident that I do not. I am surprised that more OE fans have not tried OE Classic, which is obvious from the comments section. A pity that OE Classic developer does not appear to have the resources to provide customer support & patches. Does OE Classic use the same dbx files as OE6 ? As a thought and cost effective workaround (assuming not reliant on XP for legacy software)…. I needed to resolve ‘the problem’ on my parents’ laptop and given what they use it for – a little online banking & occasional emails, it really wasn’t worth the price of Windows 8 (given the age of the machine) and a new laptop would be a bit of a waste for now. Solution: second hand version of Vista complete with COA for £30. I know, it’s not everyone’s cup of tea – most people hate it, I happen to be one of the lucky ones that’s got on fine with it for years on my laptop. The software is from a decommissioned business machine and I sourced it from a legitimate online seller. Machine’s working absolutely fine, it’s a cheap fix and it should see the laptop through to the end of Vista’s time (2017), by which time it’ll be time for a new machine in any case I’m sure. Very happy…. £30, all done, clean installation and transfer to included Windows Mail was seamless. Probably not the solution if you have legacy software that you have to run on XP tho’…. When it’s “a little online banking and email” I actually think of Linux as an even more cost effective solution. Again, not for all, but the price is right. I still use XP on my main computer. MSSE still updates and I have never had a virus problem. I hear from others how much they don’t like W8. I am backed up to the max, found a used VAIO with NVIDIA graphics driver and XP Pro and fixed the hinges, et. al. and now I have a backup computer. This one listed at $1700. My original VIAO has had a major makeover-new screen, keyboard, replacement motherboard with another for backup, replaced palm rest. And who can deny the ease and functionality of Google Desktop, replete with gadgets? What I have is stability, functionality, reliability and great screen resolution and graphics. A backup computer has Vista on it. I could only get it to work by not installing ANY updates, using Windows Defender as originally installed and Chrome browser. I can still use the Bing toolbar on IE 7. Again, no virus problem. There is no virus problem, no security threat. The hackers have bigger fish to fry. At this point the software vendors are cashing in on the consumer’s paranoia. Unless you are concerned about being au courant, as it were, and need to give evidence that you are running with the pack, I say the road less taken is still the better one on the long run. computers but i like to see what makes them, “tick”, and hence my love, like and hate, when i begin to struggle for answers. xp. I have done some when i have installed new operating system in the past, but not lately. good work which is an education in its own rights. Back up ASAP. I don’t have any horror story to tell you about backups, but I have three horror stories avoided by backups. Two cases of malware where the backup saved me days of work and one case of a system drive which simply up and died. Oh and one almost horror story of a student of min. One week after I gave a class on backing up he came to me with a hard drive which wouldn’t respond. I got it working again, but he didn’t backup it up till a couple of months later. He now backs up regularly. Bottom line: It takes a lot to overcome the inertia and do it, but once you get going, it’s like fastening seat belts. Hard to get used to doing but now you feel something’s wrong if you don’t so it. I Am a little above a novice I have two computers working great with Windows Vista – my laptop is old bur works good and is not giving any problems for use when I am away from home. _ My HP desktop HP Pavilion “a1654n ” works well but is starting to refuse demands #1 it will not zero in on late Internet Explorer and my bank and some travel agencies will not accept the older version of windows – I am not adventurous enough or smart enough to try some of the things I see in Ask Leo – Question “CAN THE HP ABOVE BE BROUGHT UP TO DATE WITH WINDOWS “10” AT A REASONABLE COST AND EFFORT – ONE OF TBHESE POP-UP OUTFITS SAID THEY CAN DO IT AND CHARGED ME FOR IT BUT HAVE ACCOMPLISHED NOTHING.